Sprigs of Rosemary: Great Steak, Dr. Salisbury! It really is just ground meat, after all. Not really “steak” as we know it. And, usually, you’ll only find the humble Salisbury Steak (pretty high fallutin’ name for something so modest) in diners and homestyle restaurants. Right alongside the meatloaf. Or chicken and biscuits. But the name comes from Doctor Salisbury! I imagined it was just named after a place – Salisbury Hill? Apparently James Henry Salisbury, a 19th century British physician was a big advocate of lots of meat -- red meat, no less -- in the diet, contrary to everything we read today. He believed that vegetables and starchy foods could produce substances that poison and paralyze the body’s tissues and cause everything from heart disease to tuberculosis to gout. He claimed our teeth are "meat teeth" and our digestive systems designed to digest lean meat, and that vegetables, fats, starches and fruit should only be 1/3 of our diet. Starch is digested slowly, so it ferments in the stomach and produces vinegar, acid, alcohol and yeast, all of which were poisonous to our systems, he claimed. His “meat cure” was a special diet that included Salisbury Steak, which should be eaten three times a day (! ), with plenty of water to flush the body’s system. My husband could live – happily – on hamburgers three days a week. Probably pizza at least two of the others. I like just a little more variety. So when a sample of Cuisine At Home arrived with a recipe for French Onion Salisbury Steak in it, I earmarked it. Then, I saw a blog I follow, Casa en la Cocina, * posted another version. Karma strikes again. The photo in the Cuisine at Home made the glorified hamburger look very much like a steak. What really makes it special is the sauce, a little in the cooking method, and definitely the shape. It’s shaped into a nice oval, not round like a regular hamburger. I suppose that nurtures the notion of “steak.” I know we thought it was great comfort food for this winter that doesn’t seem to want to take a break. Heat oil in a pan over medium-high heat. Add patties and cook about three minute on each side or until browned and remove from pan. Add the onion and sugar to the pan and cook about 3 to four minutes. Add the mushrooms and cook another two minutes longer. Stir in the garlic and tomato paste. Cook until the paste begins to turn brown in color, about 1 minute. Sprinkle the reserved flour over and cook 1 minute. Then add the broth and wine, salt and thyme. Return the meat to the pan; bring sauce to a boil and then reduce heat to medium-low, cover and simmer about 10 minutes. Sprinkle a little fresh parsley and grated Parmesan if you’d like. I served the steaks on top of lightly buttered noodles with peas and spooned the sauce over all. *What I did differently from Cuisine at Home was to use sweet onions instead of scallions in the meat mixture as well as use the Penzey's shallot-pepper seasoning instead of shallots and pepper. I also added mushrooms to the sauce mixture. The magazine's recipe also suggests serving the steaks atop cheese toasts. Your "steak" looks delicious and I'm jealous of your access to truly local protein sources, as I daresay, the local grocery just doesn't qualify. I wonder how dr Salisbury died and if it was heart related... I love Salisbury steak on a piece of starchy white bread drenched with gravy. Never would have thought of making my own, have always bought it frozen. I like the idea of making my own that way it wont be mystery meat! Thanks for sharing! Can you imagine eating beef 3 times a day! Uggh I can feel my arteries hardening. Never-the-less, this looks delicious as usual! Hope we get to see you soon! This looks so comforting and delicious! My husband loves ground meat and this would be great for him. I never knew that's where Salisbury got the name. Thanks for the little tidbit of information today - I learned something new - I can relax now. I know someone who swears by Penzey's spices. Dr. Salisbruy and Dr. Atkins would really have been great friends! I actually love diner-style foods. They bring me back to yesteryear and make me smile. And you know - you used lean ground beef so pretty virtuous! And the photo is tempting. It's been years since I had this dish - I like! And husband and family would like. I've heard of Salisbury steak, but I've never tried it before, and I certainly didn't know about its history. What a great looking bowl of meaty goodness. I hope you are having a good weekend with friends and family. Thank you for sharing with me tonight! Many blessings in the week to come. Thanks for the introduction to a new dish and its provenence. Ground beef tends to be our weeknight supper and I have fallen into a bit of a rut: cottage pie, chilli, or spag bol. This is a lovely one to add to my repertoire! You know, I'm not sure I've ever had an actual salisbury steak. I'm embarrassed to admit I've had the (not good) frozen meal variety. Hah. I will definitely need to make this at some point, it looks great and comforting! Well, I glanced through a few months of your archives and didn't notice any post titles that suggest photos of your horses. I found this though! 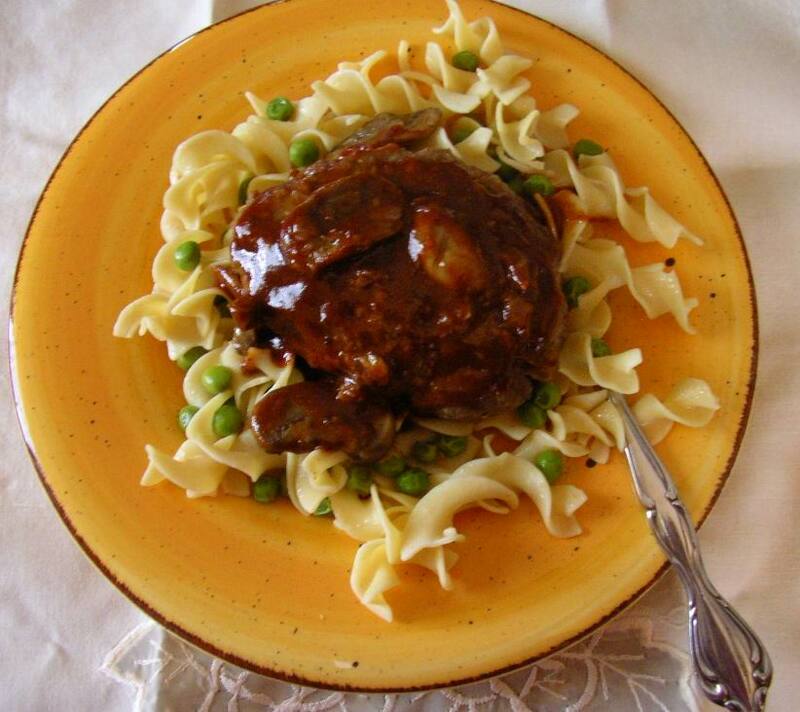 I love salisbury steak and hope to give this one a try too!